Lisa said to me yesterday, "Seems like I have been forgetting something and I just can't put my finger on it? Oh, I know! It has been a little while since we have given something away. I think we should give away a stamp set on our blog." Well, I just loved this idea! I mean who wouldn't? We only had to figure out what set to give away. That was actually not too hard because it seems like every time I am back in the creative space lately, I have been reaching for the Wackadoodle stamp set. It has quickly become my favorite new font. I asked Lisa what she thought and she liked it. "Why not do a giveaway for both the Uppercase and the Lowercase Wackadoodle?" she said. Are you kidding? That is great! What a lady! What a boss! So here it is - we are giving away a Beaducation Original Uppercase Wackadoodle Stamp Set AND a Beaducation Original Lowercase Wackadoodle Stamp Set to one lucky blog subscriber! If you are already a subscriber then just post a comment below if you would like to enter the giveaway. If not, then click on the little orange circle at the top left of this blog and subscribe! Then post a comment on this blog! We want you to win $330 worth of stamps from Beaducation, don't you??? The Giveaway contest ends Monday, October 31st. Hey, that's Halloween! I guess it kinda adds to the Wackiness of this Wackadoodle Giveaway. One lucky blog subscriber will be randomly chosen that day and we will post the winner! Don't enter if you already have a Wackadoodle set, because there are no substitutions! Thanks, good luck and of course - Happy Halloween! Our random number generator picked one lucky winner!!!!! whoo hoo! i love this set :) i am a follower on google reader and an email subscriber. hope that counts! Great blog. Glad I'm suscribed! OH. MY. GOODNESS!!! I want this font! (Actually I just want any stamps!!) What a great giveaway--thank you so much for the opportunity! I am just starting out with stamping (I do glass and other jewelry) so this would ROCK to win! Many thanks and best of luck to all of us! OoOo that is such an exciting prize! I've wanted to get myself a set of stamps but my budget hasn't allowed for it. Fingers crossed! I love Wackadoodle! Maybe 'cause it's just slightly off, like me. I've been wanting to try my hand at this for a long time, so it would be wonderful to win. Thanks for the very generous giveaway! Definitely a wonderful prize! I'm sooo excited!! What a fun giveaway! Thanks for having it! Please enter me...these are my FAVORITE stamps!! I would LOVE to win this set of stamps. It would add a whole new dimention to my beading! Great giveaway. I would love to win this and wish to participate in this giveaway. Thank you! I love these sets! What an awesome giveaway! I just started stamping thanks to your website. Your videos have been a true lifesaver and now I hope this new venture will allow me to earn a little extra while I stay home raising our three children. This stamp set would be a wonderful addition to the small cache of supplies I currently have! What an awesome giveaway! You guys are truly the best! Ooooooh, I love your blog and even more now that there is a give away!!! I love your blog! Always checking it out to see what's new! You guys are just too awesome! I've admired this set for some time now:) Great giveaway. Really adore this font!!! Been wanting it in my stamp collection for quite a while now! Wow! What a giveaway! Would love to win this set. I'm an email subscriber and follow on Facebook... Thanks for the great giveaway! Just setting up a workshop, I would love to win! Good luck to everyone! I love the Wackadoodle set!!!! I've had my eye on it for quite a while. And yes, I'm a subscriber! I would love a set of wackadoodle stamps! Wow. Thanks for the great give away. I am a subscriber and would LOVE to win the stamps! I just started hand stamping and would love to add another font! You guys are awesome! Would love to get started with this set of stamps. I've subscribed. This is a fantastic giveaway!! I soooo want to win!!! GFC follower MoonRae & I subscribe to your feed. What a wonderful give away. Thank you. Lovely gift and great blog! i took a class at bead and button and fell in love with metal working. would love these sets of stamps.thanks for the opportunity to win them. I subscribe! Would LOVE to win this! Thanks for the opportunity! What an awesome prize! And a great blog! What an amazing give-a-way! 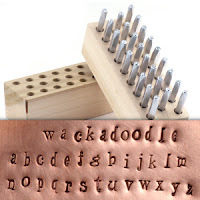 I love this stamp set...and it would look so great next to my "Stamped Metal Jewelry" book! Awesome giveaway - thanks for the chance to win! I would sooooo love to win this set!! Awesome give away!! what a great prize--would love to have this! New subscriber but been following on Facebook! Thanks for the awesome giveaway! Hey, my first time using the feed button and have it going to my email! Love to win two sets of stamps to add to my one lonely set! Hey, this is the first thing that I have subscribed to using the feed button! I have it going to me email! I would love to add 2 stamps sets to my one and only! Very cool giveaway. I'm loving it! I have been wanting to experiment with metal stamping. And I love the looks of your blog. I am happy to subscribe. Love, love, love Beaducation!! Great stamp set - and it would look simply wonderful up on my jewelry table!! My first blog. What a beautiful font. Excited!! Just recently learned about Beaducation from a Jewelery making book I purchased..I really want to learn how to create stamped jewelry.. I like its sentamental simplicity! I have stalked all of the videos and wish I could just move in!! These stamps look like FUN! I am new to your blog and will spend the nest little while reading your previous posts. Thanks for the inspiration. wackadoodle-do I want to win this! I love your stamps, and these sets would be a wonderful addition to my collection. I have become a stampaholic and LOVE these stamps!! Great giveaway, I would be thrilled to win:) An Exceptional Service Beaducation provides with a Fantastic Team! 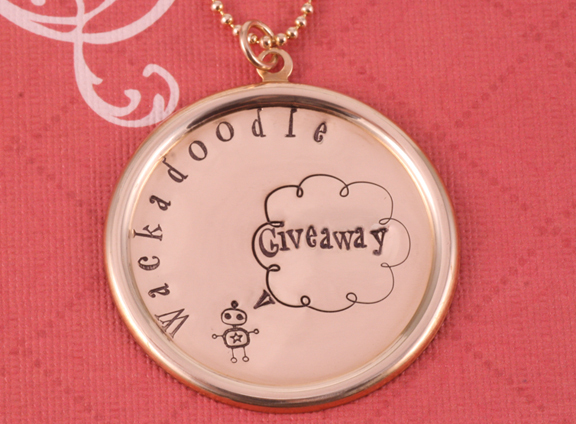 Wackadoodle-do I wanna win this prize! Happy Halloween, Ya'll! Your stamps are wonderful and I'd love to add these to my collection. If I win, this will be my first stamp set ever! Thanks for offering this giveaway! Great blog. Love these! What a great prize! I left a comment, but I don't see it. I'd love to add theses sets to the rest of my Beaducation stamps. Wow! thank you for such wonderful Giveaway! Please let me join and finger crossed that I win!!! I haven't tried stamping yet and this would certainly get me started! Wowie, just so cool letters, I'd love to have them. Didn;t know about the blog, glad I found this. I love this stamp set and all the helpful tips provided on the blog and website. Thanks for offering a great item!!!!! How fun! Looks like such a HAPPY font! I would love these stamps-who wouldn't! I love this stamp set. You have the best instructions and tips on your website!!!! !Thanks for offering this great item! I just recently got into jewelry and I receive the Art Jewelry Magazine Newsletter. This morning while reading the newsletter I found a link to Beaducation. I didn't know about your website or your blog and I have to say it was a wonderful find! As a beginner and a self learner I found your tips and tricks extremely helpful. Congratulations and keep up the good work! OOOHHH! Pick me! 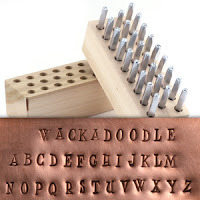 I love the Wackadoodle font, and have been wanting to metal stamp! You guys ROCK! I have been eyeing those stamp sets for so long. You seem to be the only place that really cares about usage and technique - and offers the tools to help. In order to practice, however, I'll need those stamps! I love the font! It would be a great way to get my stamping "life" started. I've been mulling over which set of stamps I would like to own. Hopefully, this comment will take care of the question! I wire wrap but have been interested in adding stamping to my designs...been eyeing your sets for awhile....but to win this set would be the greatest way to start! you have the best stamps out there & this set tops them all! Just wonderful! Good luck to all! Hit me with a noodle! Love your shop as a customer and your blog as a subscriber. I really like the article about the need to continue our work and to not expect perfection, immediately. I have learned so much about this in all aspects of my life. Unfortunately, I did not learn this at any early age, but, I finally got it! Fingers crossed, Toes crossed, love the new font.. Thanks for offering this great prize! I've been a big Beaducation fan before y'all were even Beaducation!!! Thanks too for always offering great advice and products! I would love to win!! Awesome giveaway! Thank you so much for the opportunity to win this Great set! What a super treat for Halloween!! I would love to add these to my tiny but growing sets of metal stamps what a hoot and a boon to win! Wish me luck! Oh what a great prize! Fingers crossed!! What a great give-away!!! I have been admiring this stamp set. I would love a set of these! This is such a fun font and I would love to add to the few that I have! Awesome, I love this set! I would love to win either set! Happy Halloween! Would love a bit of wackadoodle in my house! I subscribe via google reader...thanks for making the offer! I *think* I've subscribed...I tried too anyway, but Blogger doesn't like my computer right now! Ooh, I don't have this set and sure would love to add it to my stamp sets. I see many uses for this font. I would love this set I am just getting started in stamping and would love to use this font. What lovely stamp sets- would love to get creative with them! Love this stamp set -- so many uses. What a great giveaway. Very cool font. I want!!! This set looks awsome. I've got a lot of whacking and doodling to do for the holidays. Hope I win. WoW I want to win! what fun I could have with those. I make jewelry all the time and they would make a welcome addition to my tools. So I am so glad I am subscribed to this blog! I love this font! and I would love to win a set of these stamps. I have been dying for a set of your stamps and this set is fantastic! Following your blog under Regina. I love the stamp sets I've purchased from you. They are the best quality and the easiest to use. Great prize from a terrific site. Just love your products! i would love to win this set! these are just what i need to complement the alcohol ink on hand sawn/formed copper blanks i've been playing with! Wauw!!! That's a real wannahave....I" ll keep my vingers crosed. Just joined this blog!! Looking forward to reading all the new and old posts. Also have my fingers crossed for those stamps!! I would really like these. I am brand spankin' new to this blog and I think I'm really going to enjoy it! Off to read more! What an awesome giveawy! Y'all Rock!! I would love a new font set...I already adore the set I bought from Beaducation, but this delightful font would be the icing on the cake! toOutstanding prize - thanks for the opportunity! Great prize - thanks for the opportunity! I pushed the orange button to subscribe and it didn't do anything so maybe I'm already subscribed. I love all of your stuff. I own a lot of it already! More would be great!!!! I love this set- it looks so whimsical and fun! I am new to metal stamping but the first time I whacked a metal stamp with a hammer, I was HOOKED! What an ADORABLE font!!! Love it! Thanks so much for the giveaway! I would love to win. This looks like something I'd like to try. oh my - what a fabulous give away! I just subscribed to your feed. It is my first one, so be proud. I'm officially a follower and would love to add this stamp set to my collection!! Thanks for all the wonderful products y'all carry and for the videos and tutorials you post! I really like this giveaway. Sure would love to win. What a wonderful and generous giveaway!! Love the font! Thanks! Now Following on RSS Feed!!! This will be great to add to my only set of my stamps. Whoo, what an amazing giveaway. I LOVE this set, how exciting. Thanks for the chance to finally get to play with it! Great prize, I'd love to win this set it's amazing. Thanks. Oooo! Pick me, pick me! Not only would I love to use them in my jewelry, but I help teach craft classes at the library and people have been asking us to do a class on stamping. Wackadoodle stamps would be great. Thanks for the opportunity. I would love to win this - following! I am a follower and I love jewelry making. This letter set would be such a cool set to own. Please enter me. you guys are awesome! thank you so much for the chance! I love this font! Wow,just think of everything that could be stamped! Want this prize please! I am a subscriber. I love the new rhinestones! And would they not look good with this stamp set!!!! I have the rhinestones so perhaps you can pick me to get the stamps!!! Your products are great - love all that I have from yoU! Great Prize!! Count me in! I am a follower! Incredible giveaway! :) I've only got my one set of plain old stamps, and this would be wonderful! Thank-you so much for the chance! I'd love to win! Thank you for doing this! With snow flurries in the forecast, winning this prize would be a great start to making very cool holiday gifts! Cool website, lots of great information. Looking forward to your classes! Love your stamps!! I am anxiously waiting for a new order to arrive :o) Everyone wants a stamped necklace or bracelet from me! I just had the blessing of my first granddaughter & have already made something for both mom & dad! I think I signed up as a subscriber.... not sure if it was for a newsletter or blog.I would love to win the fab stamps on the blog. I love this font. Hope I win!! Holy moly, Lisa, this is wonderful!!!! This is a great giveaway! I absolutely love the wackadoodle font stamp set that you are giving away. I would love to win these! Everyone have a great Halloween! Okay, I've subscribed... hope I win! I love this set and have it on my list as the next set of letters I want to buy...maybe I'll win and can spend the money on awesome blanks instead to make more fun jewelry! Keep up the great work, I love all that you have to offer! Wowie kazowie! I wish I may, I wish I might win this delight-ful prize! I just purchased a very inexpensive set....ahem, you get what you pay for!! So, these sets would be a huge treat to have in the studio! Wonderful offer! Thanks for the giveaway! I enjoy following your blog - you guys are the greatest! I would love to win one of these sets of stamps! I just bought Lisa's book andmam slowly buying supplies so I can try my hand at stamping. I don't have any stamPs yet so this would be great! How fun! I hope I win! It would be like Christmas!!!! The sets look so cool! Thanks for your generosity! Wow, who wouldn't love to win this.Would love to have wackadoodle whimsiness in my metal stamp collection which currently consists of Kismet lowercase and a few design stamps. Subscriber and would love to win!! What a great way to introduce someone to an awesome set. Good Luck to Everyone. Thanks for such a generous giveaway to inspire all the creative souls out there. I just subscribed and boy would I love to win the Wackadoodle sets. They are my favorites and I've been drooling over them for a long time.